Patented BDC reticle: Every new Monarch riflescope model is available in BDC to allow hunters to hold “dead-on” at ranges exceeding those previously thought possible. The BDC’s unique see-through ballistic circles offer an incredible advantage for long range shooting—yet allow a normal sight picture for shorter-range shots where the crosshair itself is the aiming point. Sunshade included: Accessory sunshade eliminates glare in particularly bright conditions and keeps dust and rain off of the objective lens on rainy days or in dusty environments. 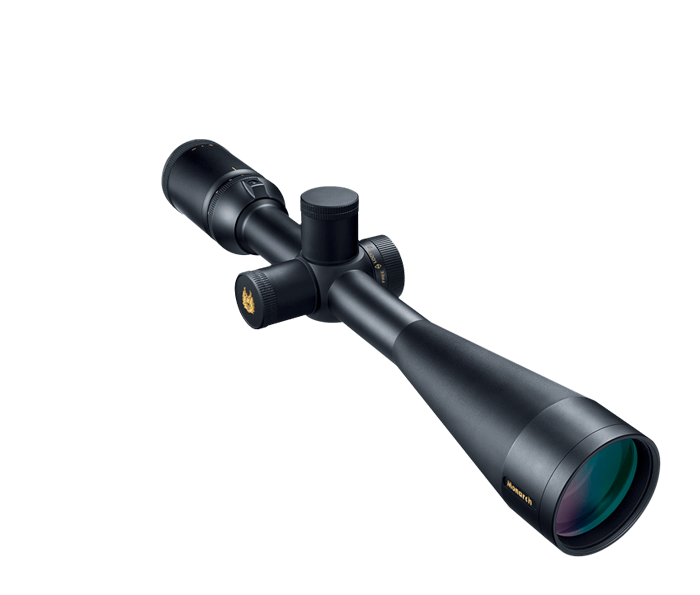 Locking side focus parallax adjustment: Standard on all Long Range monarch riflescopes, Nikon’s easy-to-reach dial allows you to quickly focus from a shooting position. Interchangeable turret technology: Long range models featuring 1/8-MOA adjustments include low profile adjustments w/ caps, target-style high profile knobs w/ caps and tapered, easy grip knobs.